Pour a half liter (16.5 ounces) bottle of distilled or purified water into Wipe Aide bottle. WARNING: DO NOT USE UNFILTERED TAP WATER. 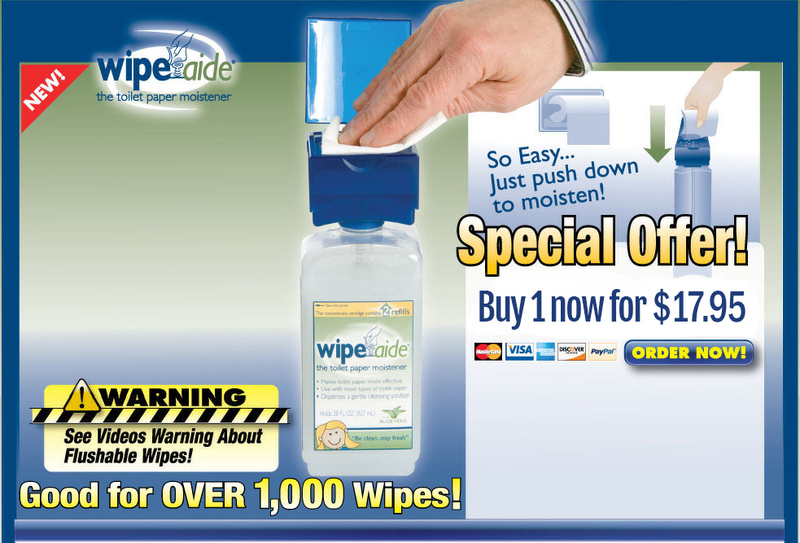 You can set the bottle into the flat side of the cover/stand to increase the height and make Wipe Aide easier to reach. WARNING: This product is for external use only. Unsafe levels of harmful bacteria will become present in the cleansing solution after a period of time. Therefore, once a month, pour out any remaining solution, clean the bottle and the top and then pour in a fresh bottle of distilled or purified water and a squirt of anti-bacterial liquid soap. (DO NOT USE UNFILTERED TAP WATER). FIRST AID: If you notice any discomfort or feel ill from using this product, discontinue using it immediately and get medical attention. IF SWALLOWED, do not induce vomiting. Rinse mouth with water and drink a glass of water. Immediately contact a poison control center. Never give anything by mouth to an unconscious person. IF IN EYES, rinse with water for at least 15 minutes. If irritation persists, get medical attention.